This message goes out to my dear parents who are celebrating their 40th wedding anniversary this week. 40 years of love, understanding and working in perfect tandem with each other and all this while keeping their sense of humor intact 🙂 Isn’t that something to be celebrated? I’ve been baking a lot of cakes and cookies over the last 6 months, but my father doesn’t have much of a sweet tooth. So it had to be something savory. 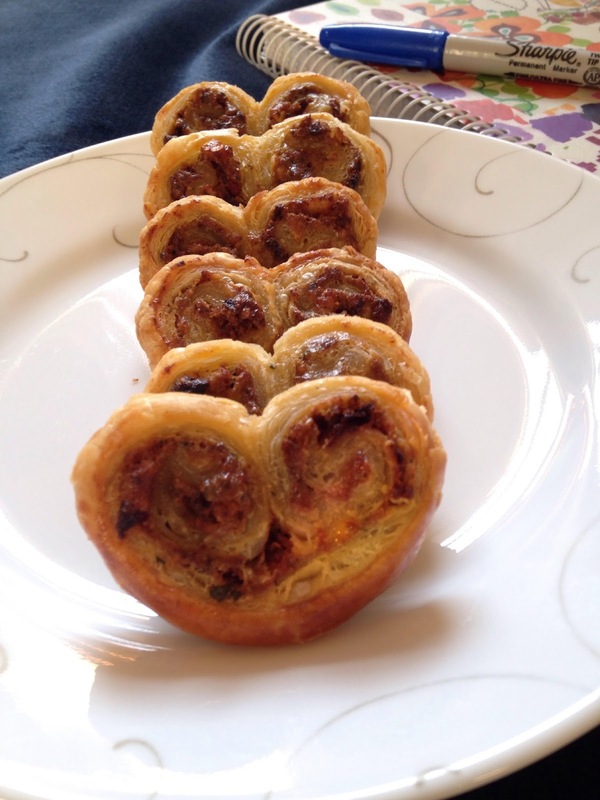 The answer came from Ina Garten, as it does most of the time 🙂 Savory Palmiers! 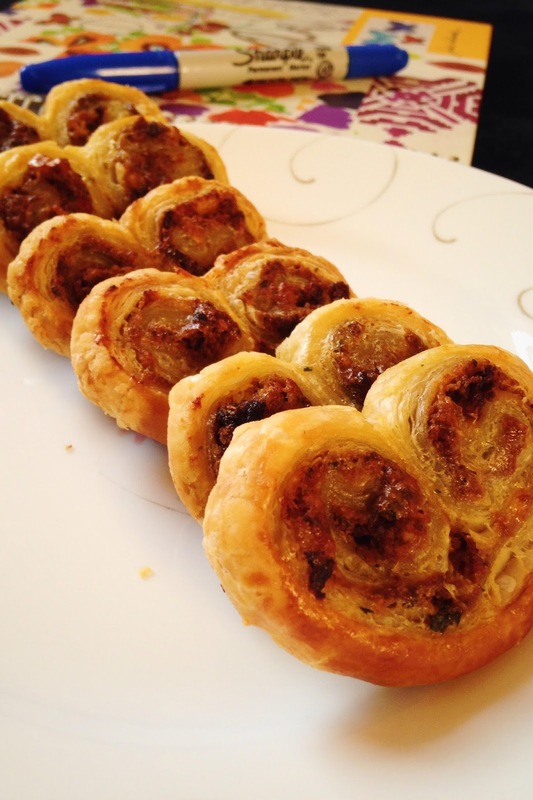 A palmier is a French pastry which is typically sweet and made with cinnamon and sugar. They also respond to elephant ears or coeur de France (French hearts). And for the first time in forever (Frozen reference! and yes, I’m singing as I type this), I had all the ingredients I needed on hand. 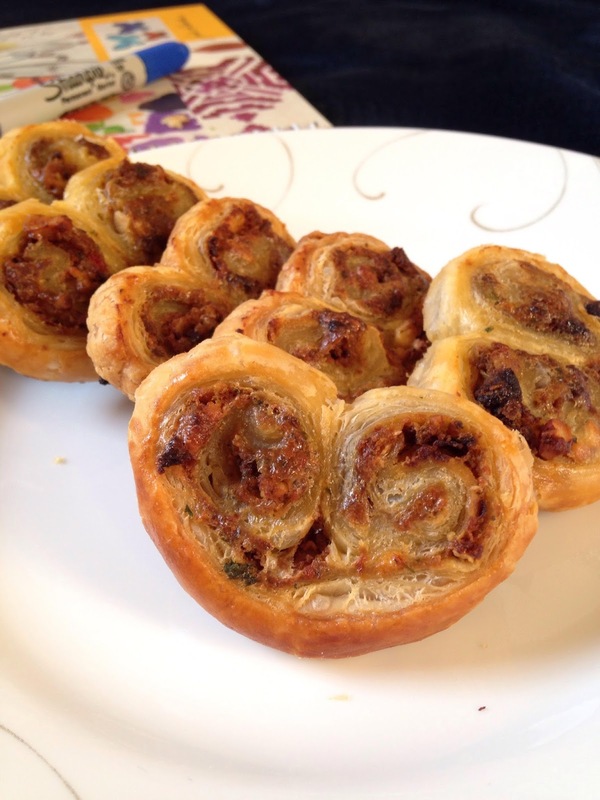 So these are savory palmiers with a sundried tomato, cilantro and almond pesto with a sprinkling of tangy feta cheese. 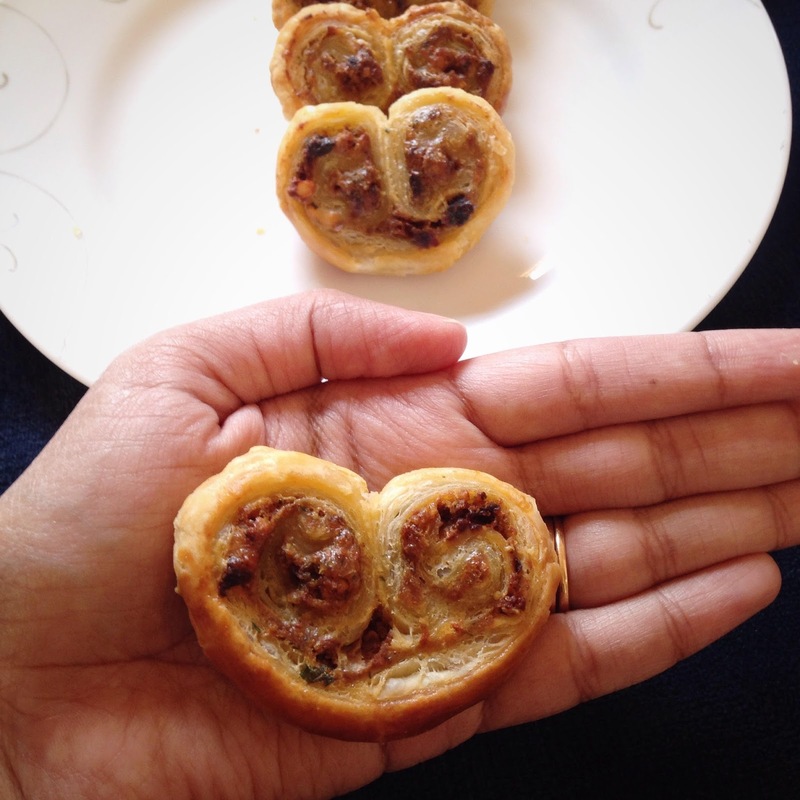 Here’s Ina Garten’s original recipe, my muse recipe 🙂 I made my palmiers with only one sheet of puff pastry and I got 22 pieces out of it. 1. Defrost your frozen puff pastry by placing it in the refrigerator the night before. But if you’re like me and have forgotten to do that, just place your puff pastry on the kitchen counter an hour before baking. 2. Next, make the pesto. Place the sun-dried tomatoes, chilli flakes, cilantro, almonds, garlic, salt & pepper in your food processor. Process until they’re roughly blended. With the motor on, pour the olive oil through the feed tube till the mixture comes together. Check for seasoning and then transfer it to a bowl. Fold in the parmesan cheese. 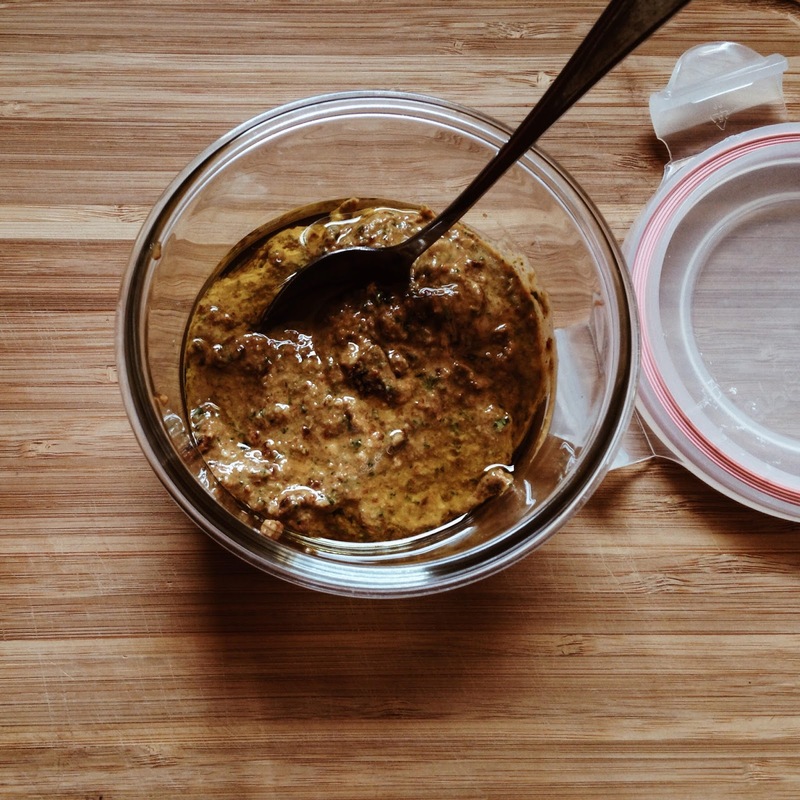 If you’re storing it, add a thin film of olive oil on top. 3. And now on to the puff pastry. Flour your kitchen counter, flour your knife, your rolling pin, your entire kitchen! 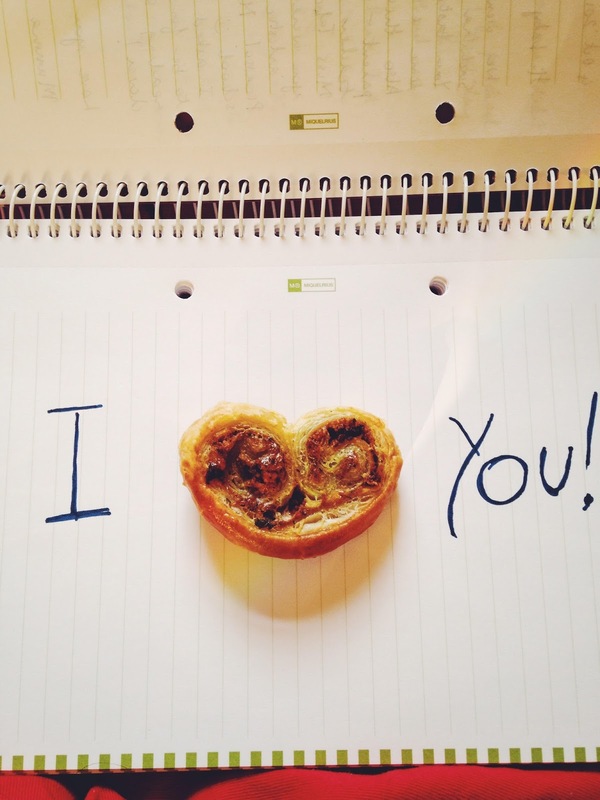 Because thawed puff pastry is stickier than your toddler after playschool. 4. 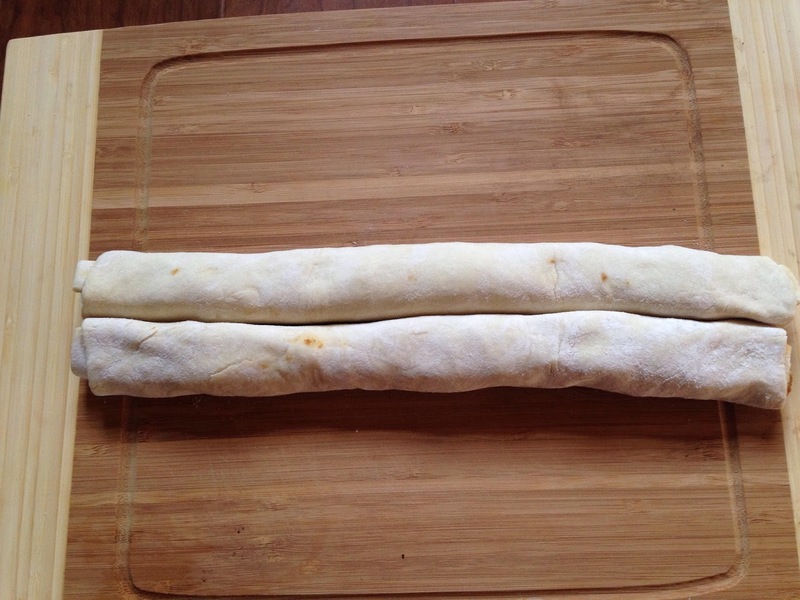 Unfold your puff pastry on a floured board or on the kitchen counter and roll it out until it’s approximately 91/2 by 11 1/2 inches. Spread the pesto on it, don’t forget the corners. Sprinkle with feta cheese. 5. Working from the short ends, fold each end halfway to the center. Then fold both sides again till they meet in the center, like so. 6. Cover it with plastic wrap and let it rest in the fridge for about an hour or until the dough firms up. Once it does, cut the dough into 1/4 inch thick slices. Place these on a parchment lined baking sheet and bake at 400 deg F for about 11-14 minutes or until golden brown. And there you have it, crunchy,tangy little bites of flavor. It’s almost Thanksgiving in my side of the world. These savory cuties make fantastic appetizers because they whet your appetite ever so slightly without filling you up. And needless to say, they’ll look great on your Thanksgiving table. This year, I am very thankful to have my parents with me. I’m thankful for the Internet, my wonderful husband and my daughter who’s just the sweetest little thing and I’m very thankful that she cannot spell yet. Codes are so very important when you’re parents 🙂 Happy Thanksgiving, folks! Gobble gobble (pun intended). That they are 🙂 Thanks! My best wishes to your parents.